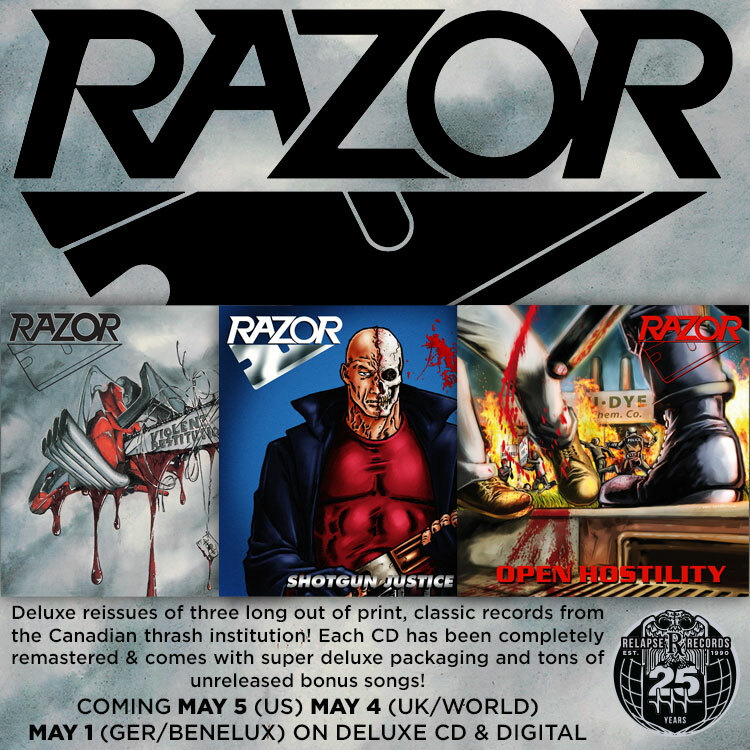 Cult Canadian thrash metal legends RAZOR have announced a reissue campaign for three of their classic late 80’s and early 90’s albums. The records Violent Restitution (1988), Shotgun Justice (1990), and Open Hostility (1991) will see deluxe CD/Digital reissues via Relapse Records this May. Long out-of-print, each reissue has been completely remastered and features expanded packaging plus previously unreleased bonus material including live songs, demos, rehearsals and never-before-heard songs. The records will be reissued on May 5th in North America, May 4th in the UK/World and May 1st in Benelux/Germany/Finland. Pre-Orders are available via this LOCATION while a remastered version of the song “Violent Restitution” can be streamed on YouTube HERE and on Soundcloud HERE. A Canadian thrash institution for over 3 decades, RAZOR have toured the world with the likes of Slayer, Venom and Motorhead and will be a headliner at this year’s Maryland Deathfest. Details on the event are available HERE. Stay tuned for more news and info on RAZOR.